Saint Remi or Remigius was born in the middle of the fifth century, of noble and pious parents. His mother, Saint Celine, had borne two other sons before him; the eldest, Saint Principius, became the twelfth bishop of Soissons, and the second was the father of Saint Lupus, thirteenth bishop of the same see. Saint Remi was given to his parents many years later, miraculously; a blind hermit named Montanus, afflicted by the state of religion in the churches of Gaul, was told three times, supernaturally, to advise his worthy parents that they would have a son who would be the light of the Francs, and would bring these new conquerors out of the idolatry in which they were plunged. The child born to them in fulfillment of the prediction, was at the age of twenty-two years acclaimed Archbishop of Rheims, despite his humble doubts as to his competence. He was unusually tall, his countenance manifested a blend of majesty and serenity; his bearing was gentle, humble, and retiring. He was learned and eloquent, and his pity and charity were boundless. In his labors he knew no weariness. His body was the outward expression of a noble and holy soul, breathing the spirit of meekness and compunction. The archbishop received the gift of miracles. When a great fire was threatening the city of Rheims with total ruin, by his presence he arrested it; he faced it with a crucifix and made the sign of the cross, and the flames retired as he advanced. He resurrected a young woman, and his fame continued to increase. For His predestined servant, God had a particular and great work in store. The south of France was in the hands of Arians, and in the last years of the 5th century the pagan Franks were wresting the north from the Romans. But Saint Remigius was loved by Clovis, the fifth of the Merovingian kings. The king was converted and baptized by him in 496, after winning the famous battle of Tolbiac, to fulfill a promise he had made to adopt the religion of his Christian wife if he repulsed the invading armies. A very large army of invaders, which had cast all of France into panic, fled in disarray when the small army of Clovis attacked, and their leader was slain. Clovis had married the noble Christian maiden known to us as Saint Clotilda, and these three acting concertedly gained virtually the entire nation to the Christian religion. 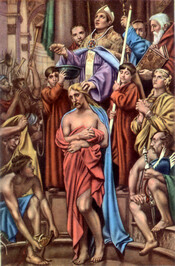 The army was baptized at the same time as Clovis, by Saint Remi and his assistants. The Saint threw down the altars of the idols, built churches, and appointed bishops. He silenced the Arians and presided at the Catholic First Council of Orleans. Eventually he converted so many that he left France a Catholic kingdom; its king was also the first crowned son of the Church, and at that time the only one. Ever since Saint Remi, Catholic France has rejoiced in its title of eldest daughter of the Church. After an episcopate of seventy-four years, the longest on record, Saint Remi died in 533, leaving to France his famous Testament, predicting God's graces of predilection for this blessed kingdom, as long as its Heads remained faithful to Him, with the most severe chastisements if the contrary ensued. The prophecy has already been fulfilled three times, as the nation's Catholic historians affirm, for the three royal dynasties. Reflection: Few men have had such natural advantages and such gifts of grace as Saint Remi, and few have done so great a work. Learn from him to comport yourself amid the world's praise, as well in its scorn, with a lowly and chastened heart. Les Petits Bollandistes: Vies des Saints, by Msgr. Paul Guérin (Bloud et Barral: Paris, 1882), Vol. 11; Little Pictorial Lives of the Saints, a compilation based on Butler's Lives of the Saints and other sources by John Gilmary Shea (Benziger Brothers: New York, 1894). Let him who thinks he is standing take heed lest he fall.